Weekend America: Walking to Alaska: Is it Really Over? Walking to Alaska: Is it Really Over? 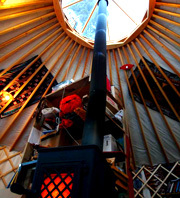 The stove and skylight of the yurt. We've spent over a year on the trail of Erin McKittrick and Bretwood "Hig" Higman. The couple started walking from their home in Seattle to Alaska back in June of 2007, and we've been periodically checking on their progress. Hig grew up in Seldovia, Alaska, and last time we checked in, that's where the couple had ended their journey. They were even thinking of calling this small, Alaskan town home. We invited them onto the show for one last hurrah and to look back at what their trek has taught them. John Moe: How are you two different now than you were before you took that first step? Bretwood "Hig" Higman: You know it's a huge piece of experience. It was over a year -- 380-some days I think. I couldn't quite sit down and specify something that happened on every one of those 380-some days, but probably on 4/5 of them I could. In a way, who you are is a big piece of that: this accumulation of experiences. And that was more experiences than I'd ever had in any one year, certainly. Erin McKittrick: More than you've had in 10 years. Clearly some things must have changed in us to change our life path. McKittrick: Well that's true too. I'm much larger. Moe: When are you due, Erin? Moe: When we last heard from you, you were talking about staying in Alaska. What's the status of that life decision right now? Higman: It's moving forward pretty well. We actually bought ourselves a yurt. Higman: It'a round, lattice [structure] with a fabric covering. Moe: You've talked to us before about the idea of home changing from day to day. What is home for you these days? McKittrick: Since we have our yurt, we have a more traditional structure that we can call "home." We can heat it, and it has power. This whole area is "home." You can look out all the windows each day and see what the mountains are doing or what the snow is doing. Higman: Either that, or "home" is where the internet connection is. Moe: How big is the yurt? Higman: 24 feet in diameter. McKittrick: Which works out to about 450 square feet. Moe: Like a small studio apartment. McKittrick: Without walls. Outside walls, but no inside walls separating things. Moe: So really nothing like a studio apartment? McKittrick: No. And a little wood stove right in the middle, which is also kind of not like a studio apartment. Moe: Well you know once you've bought a yurt, the roots are down. McKittrick: At least we don't have to deal with this whole mortgage thing, because we don't have a mortgage on our yurt. We just own one. Moe: You own the yurt outright? Moe: So there is no "yurt bubble" to worry about? Higman: Not yet, anyway. We're going to get in on the good side of the "yurt bubble," if it happens. Moe: Right. Old time yurt owners. Before long, we might all be coming to you for yurt designs. Do you think if you would have just flown up to Seldovia, instead of walked, it would feel like a place that you wanted to settle down in for a while? McKittrick: Probably not. We visited here before, for instance, a number of times before we came. Higman: Wouldn't you say you had no intention of moving to a small Alaskan village? McKittrick: Before we started walking through them? No, I had no intention. McKittrick: By being generously hosted by people in these small, little towns and seeing what life was like there, it started to seem more and more appealing. We were a little separated from all the amenities of the city, and then I realized that they weren't as important as I would have thought. Moe: From Seldovia, Alaska, where they may be for a while, "Hig" Higman and Erin McKittrick. Thanks you guys, and good luck up there. McKittrick and Higman: Thank you.